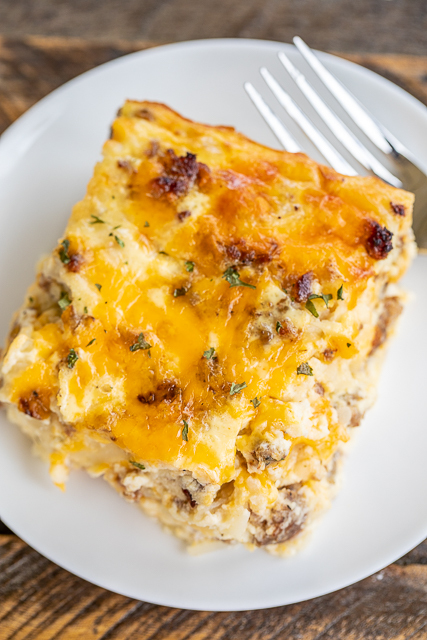 This Sausage and Ranch Hash Brown Breakfast Casserole has quickly become a favorite. 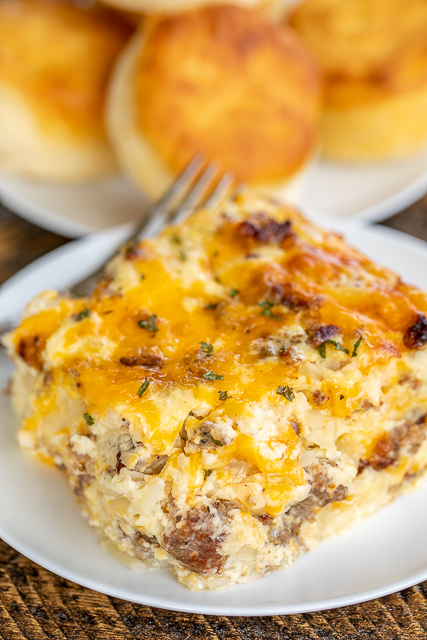 Hash brown potatoes loaded with sausage, cheese, ranch and eggs. YUM! We've eaten this for breakfast, lunch and dinner. 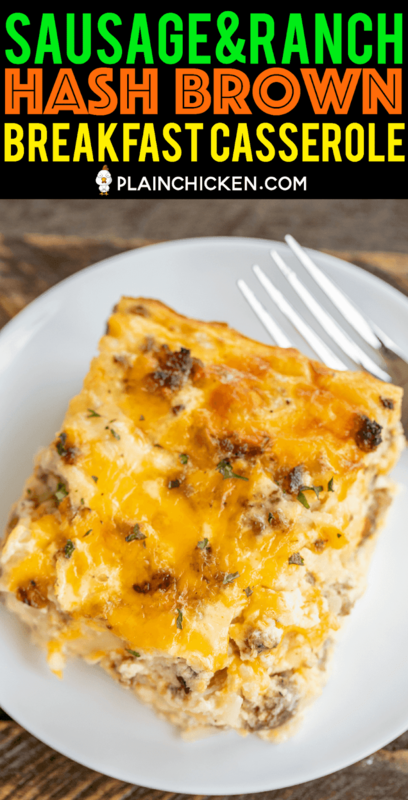 The best part about this recipe is that you can make it ahead of time and refrigerate or even freeze for later. You can even half the recipe or bake half now & freeze half for later. 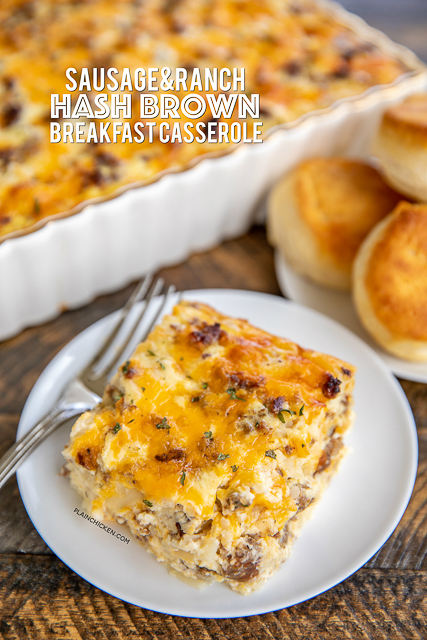 I LOVE to make this Sausage and Ranch Hash Brown Breakfast Casserole for brunch, tailgating, overnight guests and the holidays. All you need is some biscuits and a fruit salad and you have an easy feast. 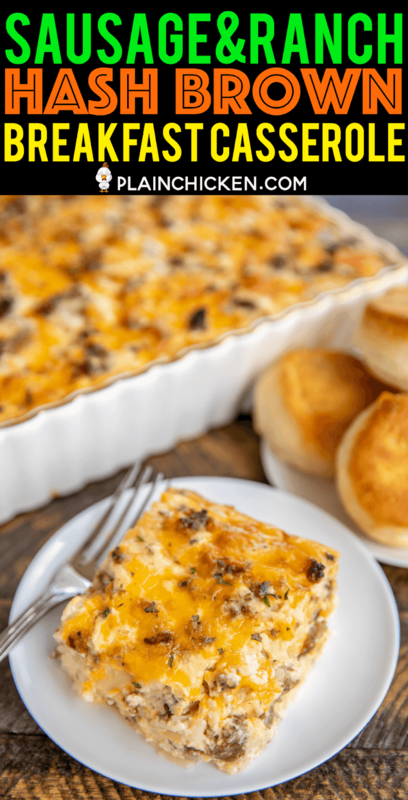 This casserole is also great to make and freeze (unbaked) for a new Mom or a friend that is having surgery. 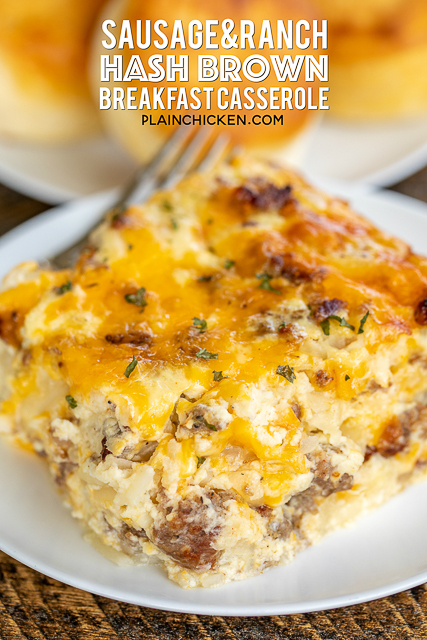 I used Jimmy Dean sausage in this Sausage and Ranch Hash Brown Breakfast Casserole. I used one package of regular and one package of hot. Feel free to use all regular or all hot sausage if you prefer. This recipe uses bottled Ranch dressing, not the dry mix. I used Hidden Valley, but I also really like Ken's Ranch dressing. Preheat oven to 350ºF. Lightly spray a 9x13-inch deep dish baking dish with cooking spray. In a large skillet, cook sausage until no longer pink. Remove from skillet. 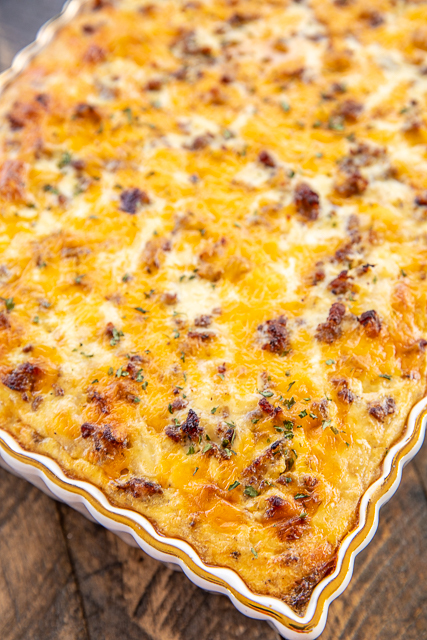 Add hash browns to skillet and cook until lightly brown. Combine cooked sausage, hash browns and Ranch dressing. Spread into prepared dish. Whisk together eggs and milk. Season with salt and pepper to taste. 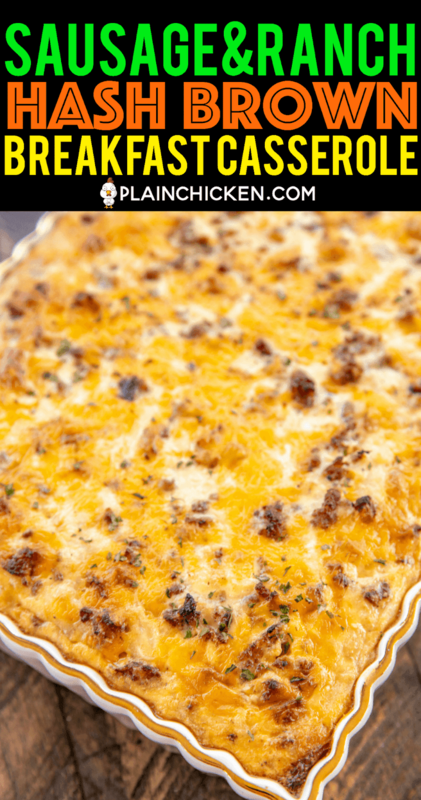 Pour over hash brown mixture.Top with shredded cheese. Bake, uncovered, for 35-40 minutes. In your instructions, you don't mention when to add your cheese??? 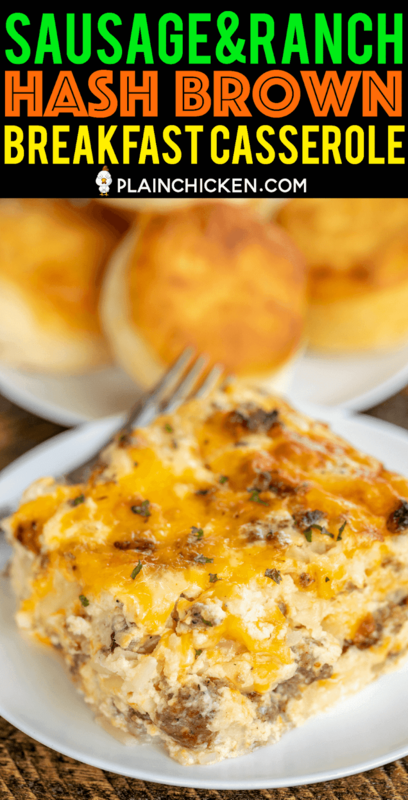 Does it go on top of the casserole, or mixed in with the eggs? What if I want to use fresh potatoes? How many is this supposed to serve?